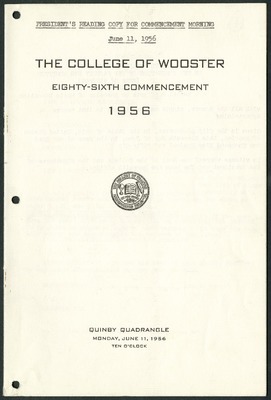 This is a full collection of the College of Wooster's commencement programs, dating from 1871-2018. 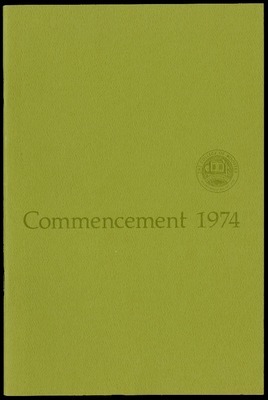 Of note are the honorary speakers, commencement address titles, and schedules of events, as well as the lists of graduates. 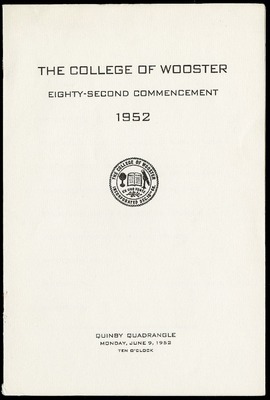 For more information on the history of graduation and commencement ceremonies at the College of Wooster, please contact Special Collections. This program holds the information about the commencement ceremony for the graduates of the class of 2018. 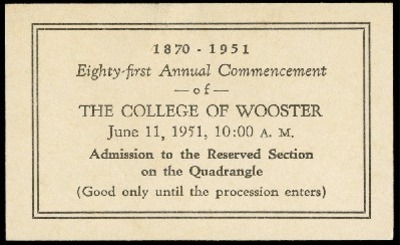 This ceremony took place on Monday, May 14 in the Scot Center at the College of Wooster. 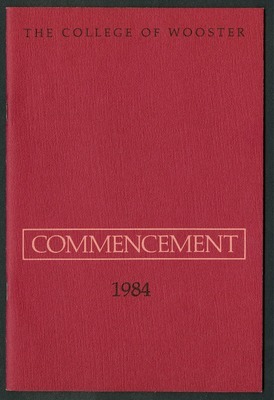 The Commencement address was given by Dr. Eboo Patel. The Senior Class Welcome was given by Dana Michelle Smith and Avi Vajpeyi. 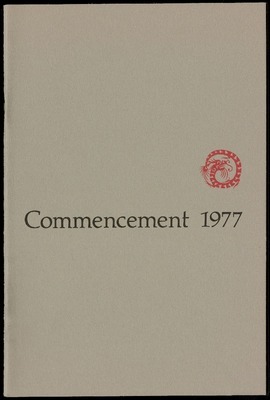 This booklet also contains those who were conferred on August 21 and December 31 of 2017. 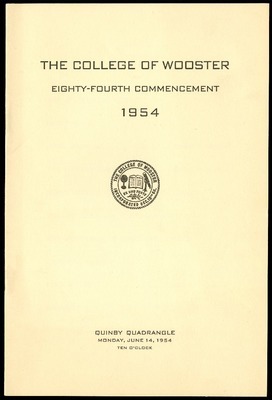 This program encompasses the information regarding the graduates of the 2017 class from the College of Wooster. 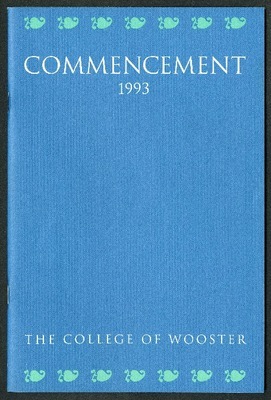 The commencement took place on May 15 at 10 o'clock. 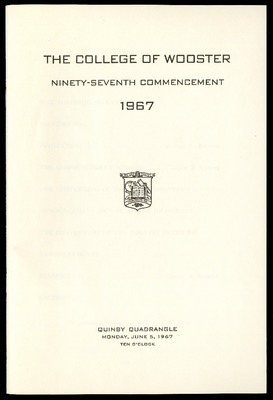 This program lists the college's mission on the first page, and those who participated in the commencement on the next: the drum majors, bagpipers, and drummers. 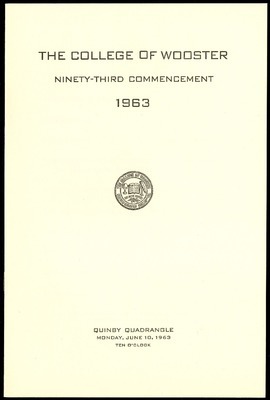 The commencement address was given by Dr. Grant H. Cornwell, who was president of the college from 2007 to 2015. This year, the presiding president was President Sarah R. Bolton. 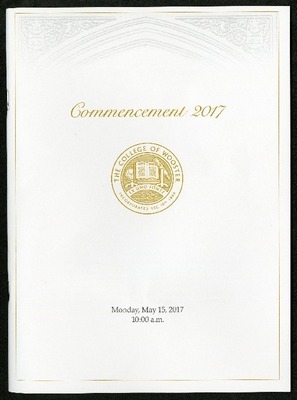 This program also features the names whose degrees were conferred on August 31 of 2016 and December 31 of 2016. 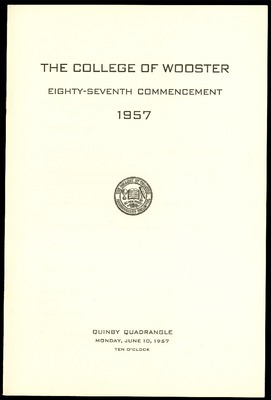 This program features the information regarding the commencement of 2016 at The College of Wooster. 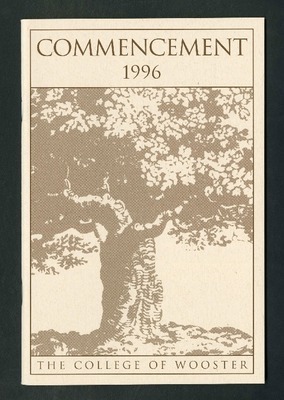 It took place on May 16 at 10 o'clock in the morning on the Oak Grove. 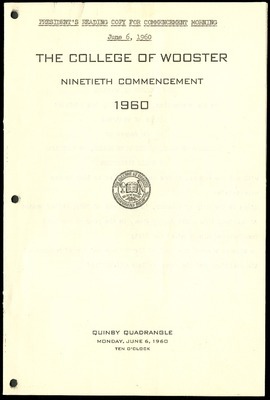 The presiding interim president was President S. Georgia Nugent; there is a paragraph about background within. 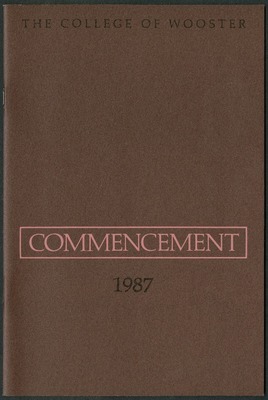 Also featured within this program are those who had their degrees conferred on August 31 of 2015. 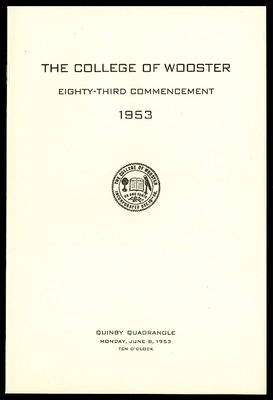 This program features the information regarding the 2015 commencement ceremony at the College of Wooster on May 11. 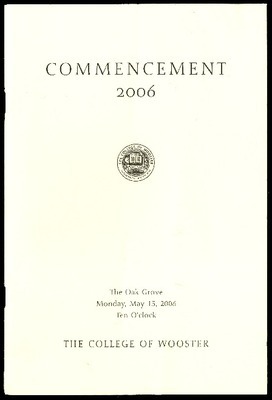 The ceremony occurred at 10 o'clock on the Oak Grove. The, "For the Class of 2015" speeches were given by Gentry Kerwood and Laura Y. Merrell. 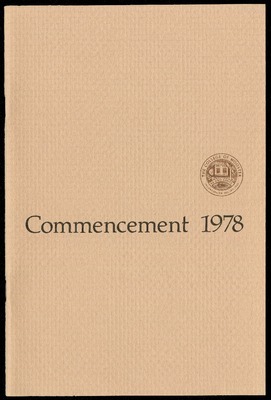 The commencement address was given by Jennifer Haverkamp of the class of '79, and it was titled, "Field Notes from Beyond the Arch." There is a short biography about Jennifer Haverkamp and Patricia Hill Collins. 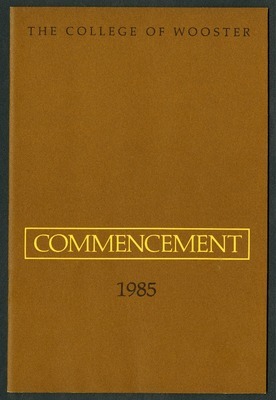 Those who had degrees conferred on August 31 of 2014 are also contained within this program. 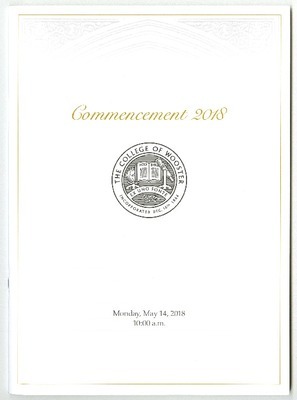 This program is filled with the graduates that were featured in the 2014 Commencement Ceremony, as well as those who were conferred on August 31st of 2013. 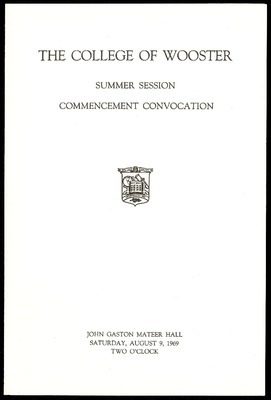 The, "For the Class of 2014" speech was given by Zachary H. Harvey, and Mae Manupipatpong. The procession and recession was led by the Scot Pipers. 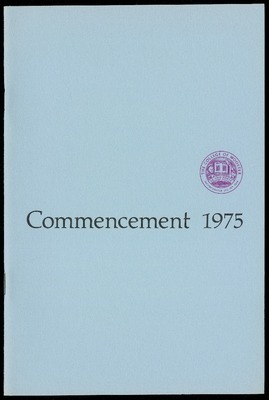 This program features the events that took place the weekend prior to the 2014 commencement ceremony. 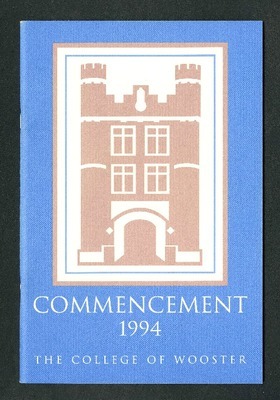 Some of the activities that occurred were: brunch, a night out, and cap and gown pick up. 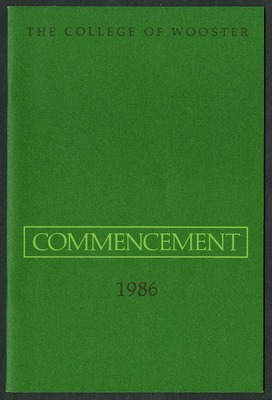 This program holds the information about the commencement ceremony for the graduates of the class of 2013. 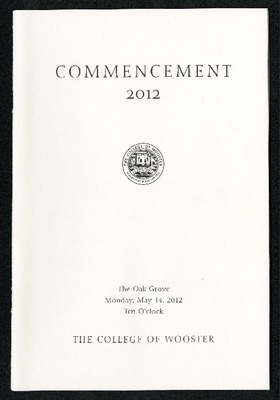 This ceremony took place on Monday, May 13 on the Oak Grove at the College of Wooster. 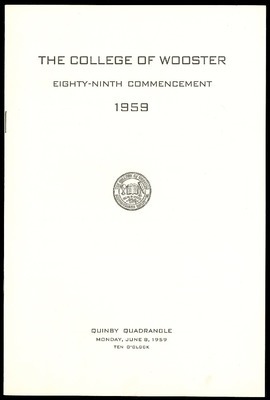 The, "For the Class of 2013" speech was given by John H. Bracey, Jr., and Jacqueline K. Barton. 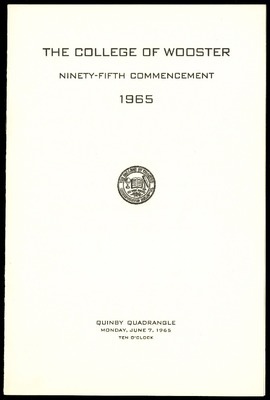 This booklet also contains those who were conferred on October 31 of 2012. 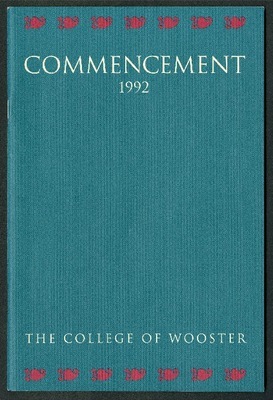 This program holds the data pertaining to the 2012 commencement ceremony at The College of Wooster. 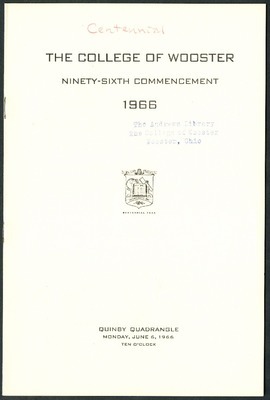 The ceremony was held on May 14th at ten o'clock on the Oak Grove. 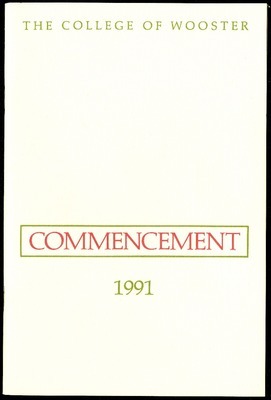 The, "For the Class of 2012" speech was given by Kathleen Blachman and Aaron Novick. 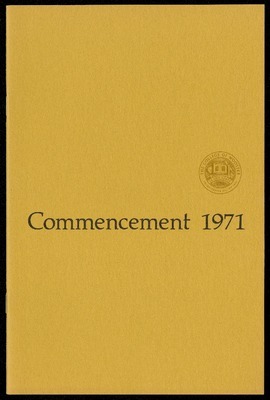 This program also contains those who were conferred on October 31st of 2011. 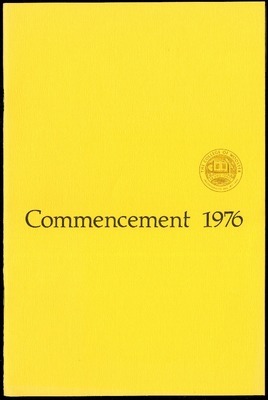 This is the flyer that features the information pertaining to the events that occurred the weekend prior to the commencement ceremony in 2012. 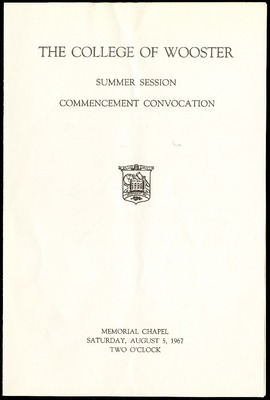 Some of the events included: planting a class tree, a baccalaureate service, and a class picnic. 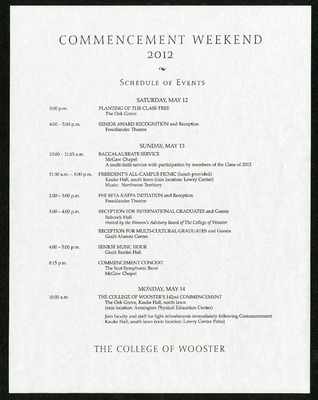 The program features the information regarding the 2011 commencement at the College of Wooster. 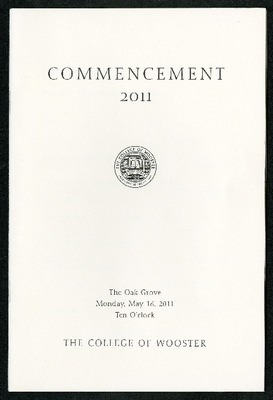 The commencement took place on May 16th at 10 o'clock in the Oak Grove. The presiding president was President Grant H. Cornwell. 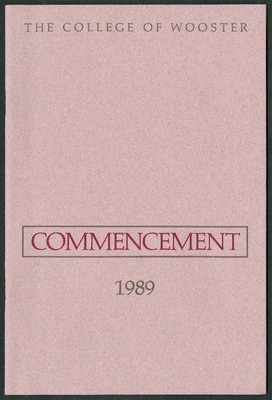 Lauren Camacci and Chelsea R. Fisher presented the, "For the Class of 2011" speech. 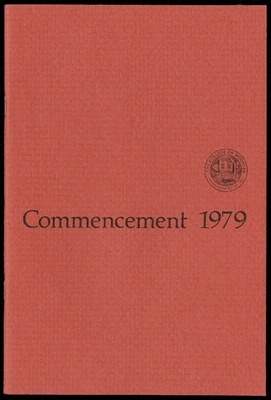 This program also holds the names of those whose degrees were conferred on October 31, 2010. 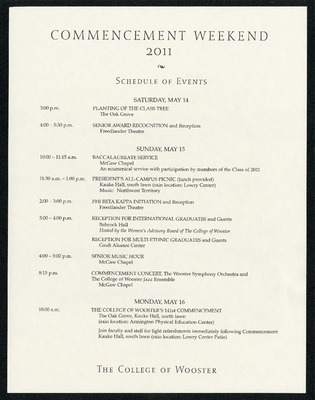 This is the program of the events that occurred the weekend before the 141st commencement ceremony took place. 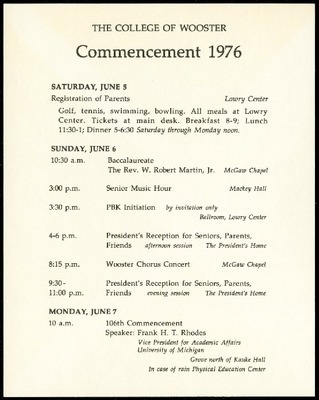 Some of the events that happened were: a picnic, reward reception, baccalaureate, and the planting of a class tree. 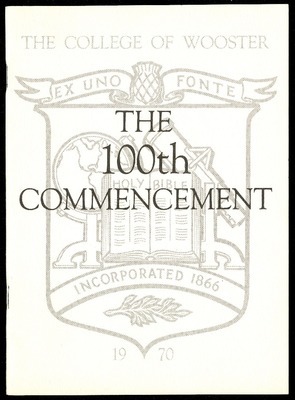 This program holds the information regarding the 2010 commencement ceremony that took place on the Oak Grove at the College of Wooster on Monday, May 10th at ten o'clock in the morning. 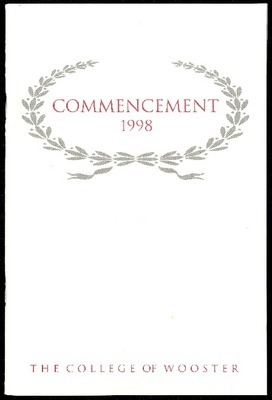 There was a speech titled, "For the Class of 2010" given by Elizabeth Christine Maffetone and Ryan Wilson Story. 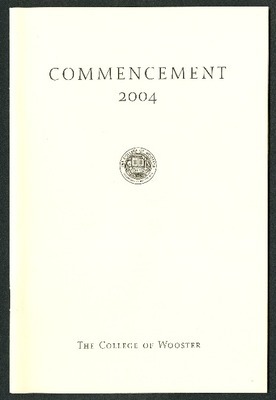 This commencement program also holds the names of those who were conferred on October 31st of 2009. 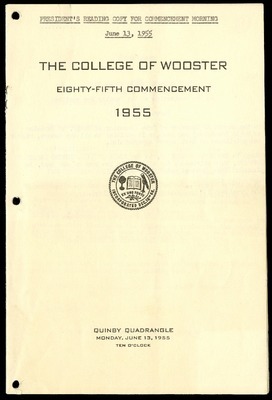 This program features the information regarding the 2009 commencement ceremony at The College of Wooster. It took place on Monday, May 11 at ten o'clock on the Oak Grove. 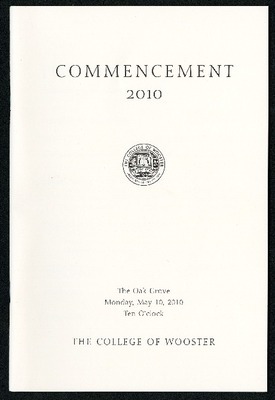 There is no mention of a commencement address, but there is a speech titled, "For the Class of 2009" given by Jacqueline Julia Rau and Russell Lee Roberts. 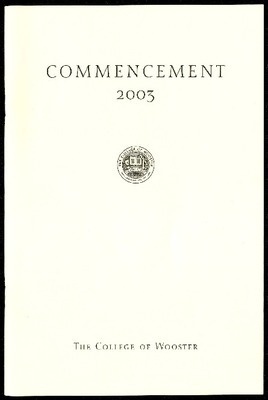 The program also features those who had degrees conferred on October 25 of 2008. 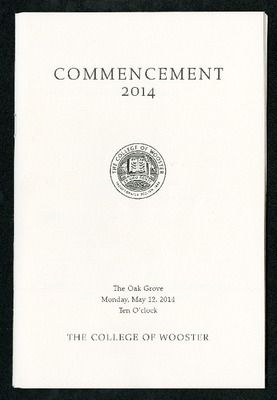 The College of Wooster held the 2008 commencement ceremony on Monday, May 12 at ten o'clock on the Oak Grove. The ceremony was led and dismissed by the Scot Pipers. 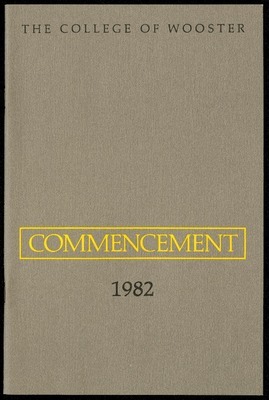 There was no mention of a commencement address. 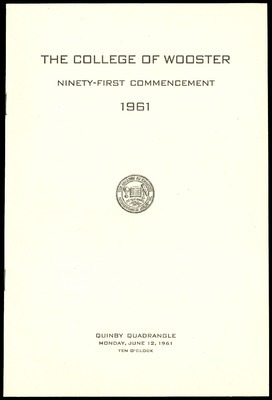 Grant H. Cornwell was the presiding president. 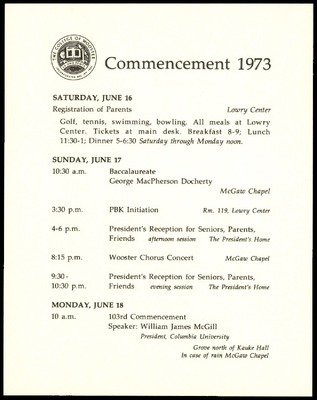 This is the program of the events that occurred the weekend before the commencement ceremony took place. 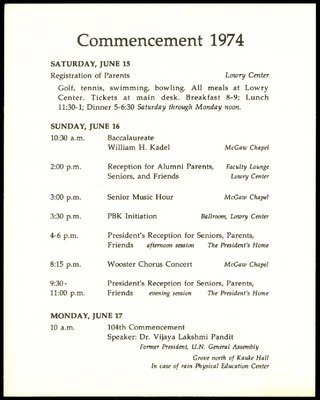 Some of the events that happened were: a picnic, baccalaureate, and the planting of a class tree. 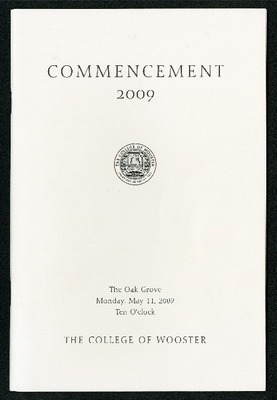 The College of Wooster held the commencement ceremony of 2007 on May 14 at ten o'clock on the Oak Grove. 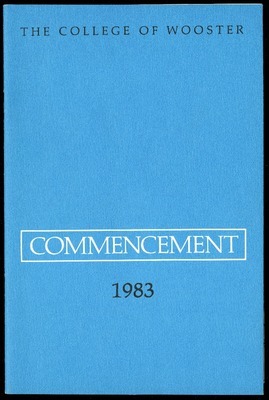 The commencement address was given by Dr. Steven Koblik and it was titled, "Friendship." The degrees that were conferred on October 28, 2006 are also included in this program. 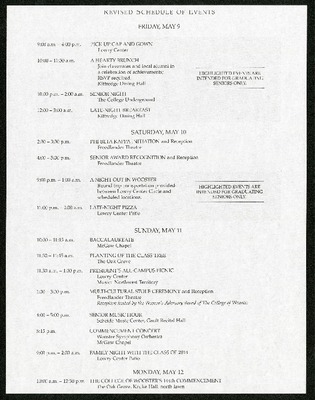 This is a schedule of events from the weekend before the 2007 commencement ceremony. The weekend included: planting a class tree, senior award recognition, baccalaureate ceremony, and more. 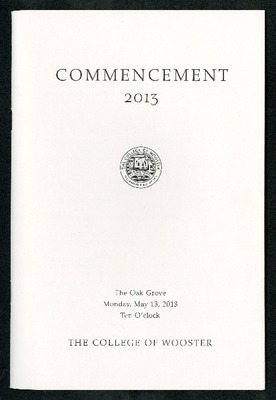 The College of Wooster held the 2006 commencement on Monday, May 15 in the Oak Grove at 10 o'clock in the morning. 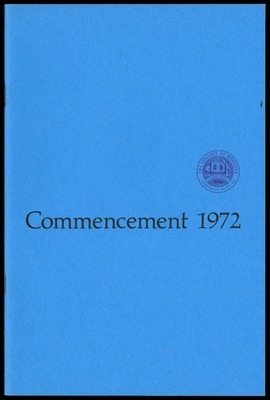 Dr. Carol Geary Schneider gave the commencement address that was titled, "Liberal Education: Employers' Views, and Yours." The Scot Pipers led the procession and the recessional. The degrees conferred from October 29, 2005 are included in this program. 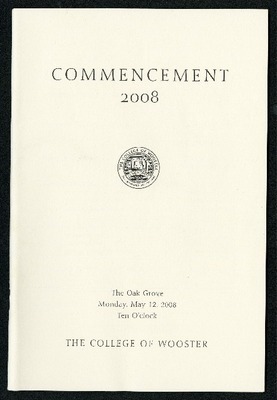 The College of Wooster's 2005 commencement ceremony took place on Monday, May 16 at 10 o'clock on the Oak Grove. 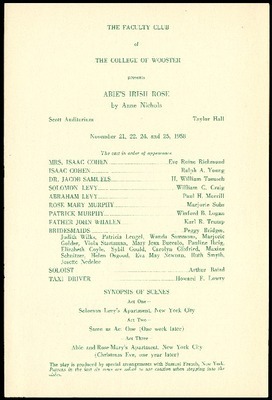 The president of the college was R. Stanton Hales. 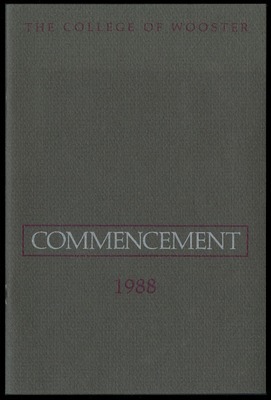 Dr. Freeman A. Hrabowski III gave the commencement speech titled, "The Value of a Liberal Arts Education in the 21st Century." The degrees that were conferred on October 9th of 2004 are also featured in this program. 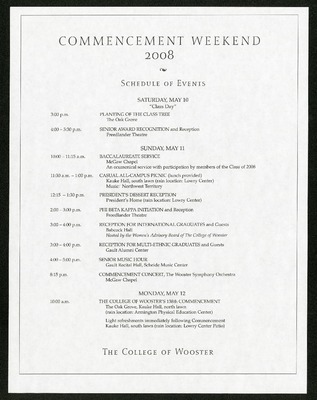 The 2004 College of Wooster commencement ceremony took place on Monday, May 10, 2004 on the Oak Grove at ten o'clock. 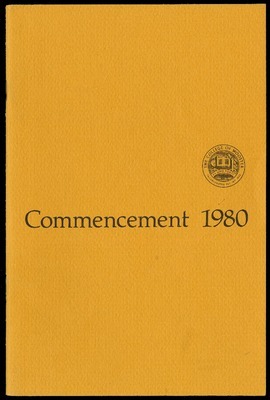 Dr. Robert Weisbuch gave the commencement address that was titled, "Wooster Graduates Take Over America: A 21st Century Renaissance." 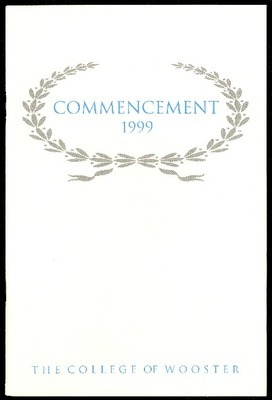 The program also features the degrees that were conferred on October 16 of 2003. Monday, May 12 at ten o'clock on the Oak Grove of The College of Wooster campus is when the 2003 commencement ceremony took place. The ceremony was led and dismissed by the Scot Pipers. 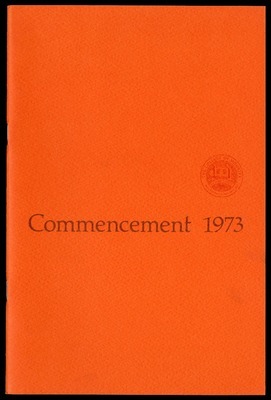 The commencement address titled, "Embarrassment, Rejections and Other Paths to a Good Life" was given by Mary T. Schmich. 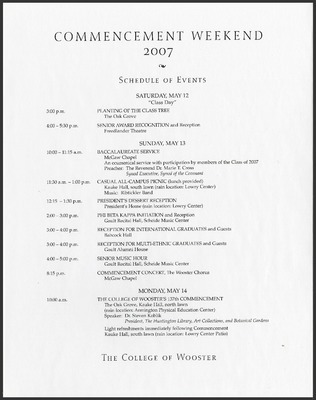 The 2002 Commencement at The College of Wooster took place on Monday, May 13 at ten o'clock in the morning. 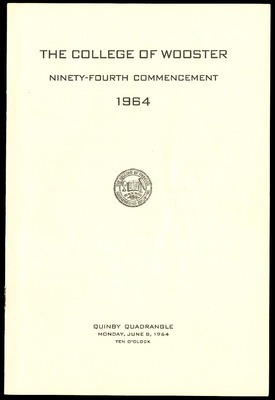 The commencement address was given by the Honorable Solomon Oliver Jr. from the class of 1969. 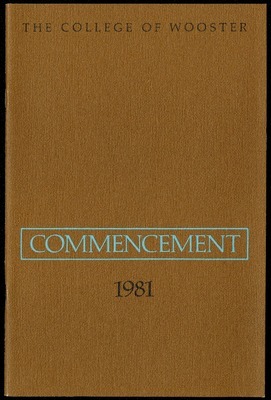 His commencement address was titled, "Meeting Life's Challenges: Climbing Stairs and Turning Corners." The procession and recession were led by the Scot Pipers. 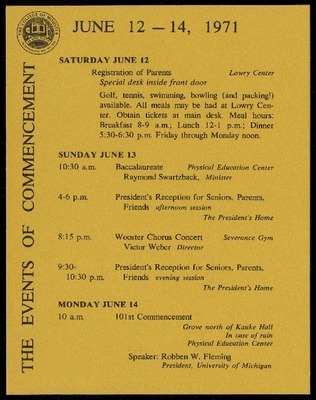 The 2001 Commencement at The College of Wooster took place on the Oak Grove at 10 o'clock in the morning on Monday May 14. The presiding president was R. Stanton Hales. 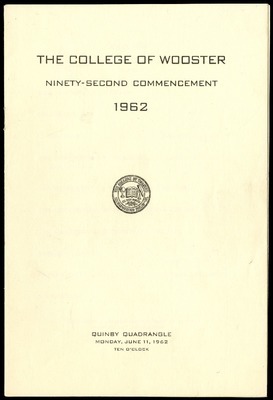 The commencement address was given by Andy Rooney and was titled, "The End of Invention." 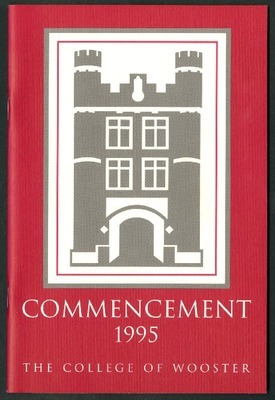 It features the degrees that were conferred on October 14, 2000. 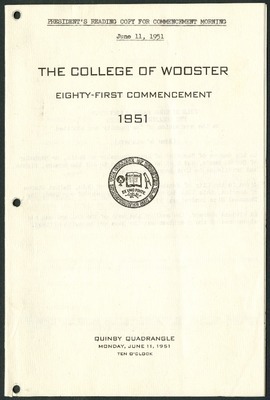 The College of Wooster held the 2000 commencement ceremony in the Oak Grove at ten o'clock on May 15. 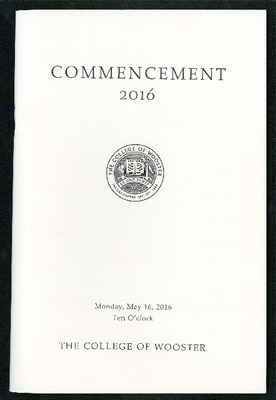 The commencement address titled, "New Challenges for a Changing World" was given by Ama Ata Aidoo. 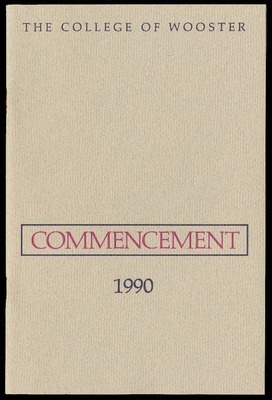 This program also features the degrees that were conferred on October 23, 1999. 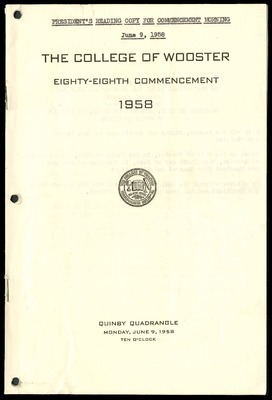 The twenty-sixth page features a description of what academic costume is and the meaning behind it. 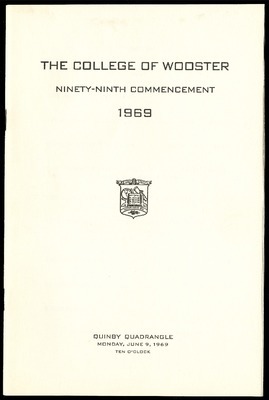 The Commencement of 1999 at The College of Wooster took place on Monday, May 10, 1999 at ten o'clock. President R. Stanton Hales was the presiding president this year. 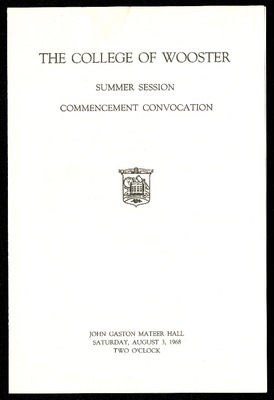 The commencement address was given by E. Gordon Gee, and the title is not mentioned. 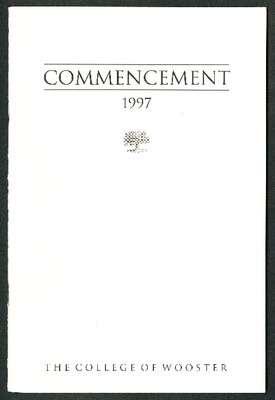 Within this commencement program also lies the list of those who were commenced on October 17, 1998.